Objective: To find a hematological parameter and the cut-off level for identification of nonsickling hemoglobinopathies in pregnant women. Materials and methods: Venous blood samples of 849 women with singleton pregnancies were collected at the first visit. All women who met inclusion criteria were examined for nonsickling hemoglobinopathy. On the basis of the sensitivity and the specificity of different cut-off levels for hematological parameters, we calculated the optimal clinically practicable parameter for screening of nonsickling hemoglobinopathies in pregnant women. Results: On the basis of the sensitivity and the specificity, the best screening parameters for the identification of nonsickling hemoglobinopathies among nonanemic pregnant women are mean corpuscular volume (MCV) with cut-off ≤80 fL (Youden’s index 91.2%), mean corpuscular hemoglobin (MCH) <27.5 pg (Youden’s index 90.7%), and microcytosis (MRC) ≥3% (Youden’s index 90.2%). An analysis using receiver operating characteristic curves and the calculated Youden’s index showed that MCV ≤76 fL, MCH ≤24 pg, or MRC ≥10% are the best red blood cell indices for the screening of nonsickling hemoglobinopathy among anemic women with iron deficiency. Conclusion: Our results suggest targeted screening for nonsickling hemoglobinopathies in nonanemic pregnant women with MCV ≤80 fL, MCH ≤27.5 pg, or MRC ≥3% and in anemic women with MCV ≤76 fL, MCH ≤24 pg, or MRC ≥10%. Antenatal nonsickling hemoglobinopathy screening in low-prevalence areas, the so-called targeted antenatal nonsickling hemoglobinopathies screening, means a two-step algorithm. The first step is a routine examination of RBC indices. However, to this day there are no generally used hematological parameters with a specific cut-off. Most laboratories use low mean corpuscular volume (MCV), low mean corpuscular hemoglobin (MCH), or high microcytosis (MRC) as criteria for screening, but the specific cut-off under which further investigation is carried out varies widely. Older studies quote an MCH <27 pg as a criterion,1,6 more recent ones quote MCH <26 pg7 and MCV <78 fL,1 MCV <85 fL,6 or MCV <80 fL.7 Using these parameters we cannot identify women with normal red cell indices (silent thalassemia and silent hemoglobinopathy) as well as women with sickle cell disorders (sickle cell trait and sickle cell disease). In women with positive RBC indices, laboratory diagnosis should be conducted.8 Any woman with a hemoglobin variant whose partner has not been tested has been offered to have her partner tested for hemoglobinopathy. As a result of the migration of people from countries with a high prevalence of hemoglobin disorders, laboratory diagnosis is of growing importance in North-West Europe. The aim of the early identification of women with nonsickling hemoglobinopathies is to optimize prenatal care.9 The purpose of this study is to determine a cut-off level of RBC indices for targeted nonsickling hemoglobinopathy screening in pregnant women. A prospective cross-sectional study was carried out at the Department of Obstetrics and Gynecology, University Hospital Zurich. We examined 849 pregnant women with singleton pregnancies for their hematological status on the first visit to our antenatal clinic. The study was approved by the Human Research Ethics Committee at the Women’s Hospital in Zurich. Written and informed consent was obtained before the examination for the identification of nonsickling hemoglobinopathy was conducted. Women who met inclusion criteria were tested for nonsickling hemoglobinopathy. Inclusion criteria for testing of nonsickling hemoglobinopathy were MCH ≤28 pg, MCV ≤81 fL, and MRC ≥3% in nonanemic women and MCH ≤26 pg, MCV ≤77 fL, and MRC ≥3% in anemic women. Women with sickle cell anemia were excluded from this analysis due to negative, ie, normal hematological parameters. According to current guidelines based on the recommendations of the Centers for Disease Control (USA), anemia in pregnancy is defined as an Hb value <110 g/L in both the first and third trimester and an Hb value <105 g/L in the second trimester.10 We diagnosed iron depletion if the serum ferritin was ≤20 μg/L.11,12 In all anemic women, the ascertainment of ferritin, CRP, folic acid, and vitamin B12 were conducted. Iron deficiency anemia (IDA) was defined as Hb <110 g/L and serum ferritin ≤20 μg/L. Anemia of other etiology was defined as Hb <110 g/L and ferritin >20 μg/L. This group included the following: vitamin B12 deficiency, folic acid deficiency, chronic inflammatory diseases (particularly HIV-positive women, hepatitis B, lupus erythematosus, etc), liver or kidney disease, etc. We determined and compared the mean level of Hb, RBC, HCT, MCV, and MCH in all women; median of MRC and HRC in all women; and ferritin in women with inclusion criteria or with anemia. There were four groups of women: women with nonsickling hemoglobinopathy (group 1), women with IDA (group 2), women with anemia of other etiology (group 3), and nonanemic women (group 4). 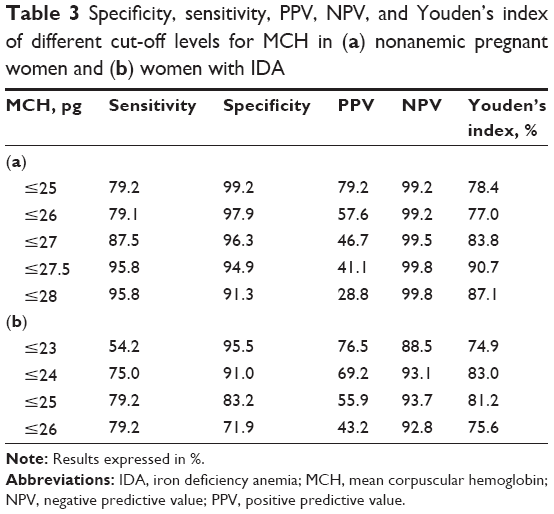 We determined sensitivity, specificity, positive predictive value (PPV), negative predictive value (NPV), and Youden’s index of the following parameters in women with IDA: MCH with cut-off levels of ≤25 pg, ≤26 pg, ≤27 pg, <27.5 pg, and ≤28 pg; MCV with cut-off levels of ≤75 fL, ≤76 fL, ≤77 fL, ≤78 fL, ≤79 fL, ≤80 fL, and ≤81 fL; and MRC with cut-off levels of ≥3%, ≥5%, ≥10%, and ≥15% in nonanemic women; and MCH with cut-off ≤23 pg, ≤24 pg, ≤25 pg, and <26 pg; MCV with cut-off levels of ≤74 fL, ≤75 fL, ≤76 fL, and ≤77 fL; and MRC with cut-off levels of ≥3%, ≥5%, ≥10%, and ≥15%. 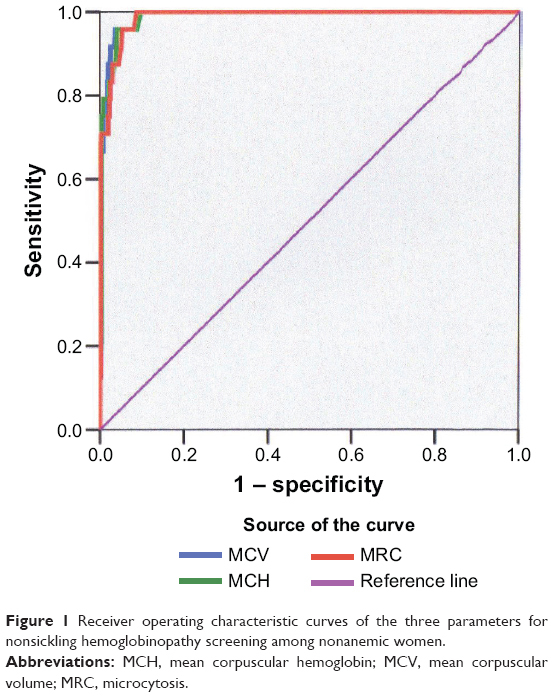 Receiver operating characteristic curves were used to construct a graphic representation of the relation between sensitivity and specificity of the inclusion hematological parameters (MCV, MCH, and MRC). Statistical analysis was performed with Intercooled Stata 8.2 for Windows (www.stata.com). The mean of hematological parameters (Hb, RBC, HCT, MCV, and MCH) and median of ferritin, HCR, and MRC and the standard deviation within the range were calculated for each group. 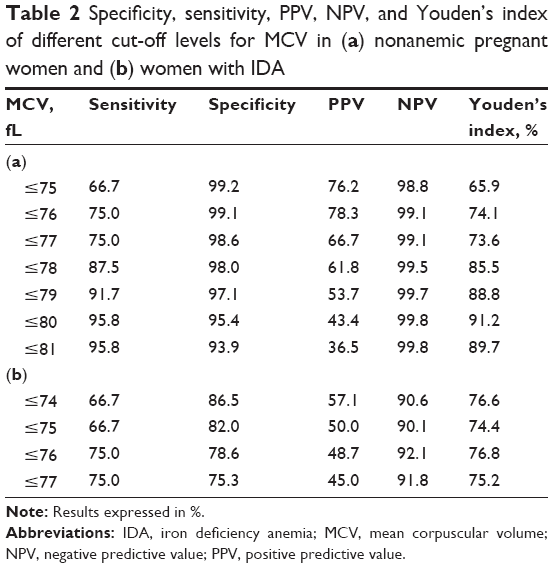 Specificity, sensitivity, PPV, NPV, and Youden’s index of different cut-off levels for MCV, MCH, and MRC in nonanemic pregnant women and women with IDA were calculated. The sensitivity was calculated as true positive/(true positive+false negative); the specificity was calculated as: true negative/(true negative+false positive); PPV was calculated as: true positive/(true positive+false positive); NPV was calculated as: (true negative/true negative+false negative); Youden’s index was calculated as (sensitivity+specificity)–100. 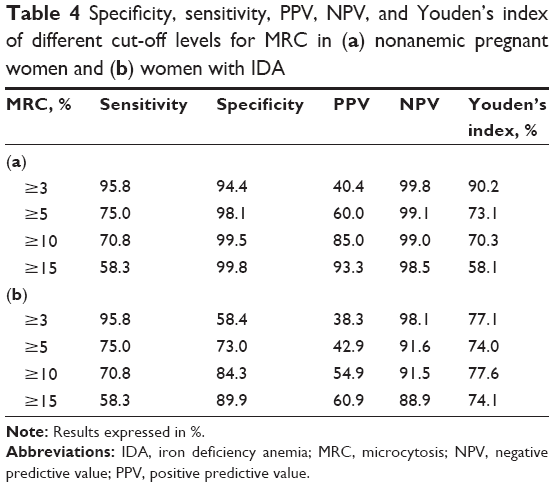 Receiver operating characteristic curves were used to construct a graphic representation of the relation between sensitivity and specificity of the three hematological parameters (MCV, MCH, and MRC) with a highest sensitivity and specificity over all possible diagnostic cut-off values in nonanemic and anemic pregnant women. There were 849 women during enrolment and 829 women during the final analysis. Twenty women with MCH ≤25 pg, MCV ≤75 fL, and/or with anemia were excluded from the analysis due to loss to follow-up (9/20), poor compliance (8/20), or negative hematological screening parameters in women with sickle cell anemia (3/20). The hematological data of the four groups are shown in Table 1. The mean hemoglobin in the group with nonsickling hemoglobinopathies was 112±14 g/L. Only 12 women with nonsickling hemoglobinopathy suffered from anemia (12/24; 50%) and 6 had concomitant iron deficiency (6/24; 25%). However, the median of ferritin in this group was 50 μg/L and the median of hypochromic red cells for this group (7.6%) was higher than that in the group with IDA (2.8%). There was an increased erythrocyte count (mean RBC 4.8±0.5×106/μL) and increased MRC (median MRC 18.6%) in this group of women. The mean gestational age on recruitment was 18±2 weeks. Note: Parameter was not determined in this group. Abbreviations: Hb, hemoglobin; HCT, hematocrit; IDA, iron deficiency anemia; MCH, mean corpuscular hemoglobin; MCV, mean corpuscular volume; MRC, microcytosis; HRC, hypochromic erythrocytes; RBC, red blood cell; SD, standard deviation. The overall prevalence of nonsickling hemoglobinopathies was 3.3% (27/829). There were nine women with homozygous α-thalassemia and six with heterozygous α-thalassemia, one with homozygous β-thalassemia and six women with heterozygous β-thalassemia, two with hemoglobinopathy E, two women with heterozygous sickle cell anemia, and one with homozygous sickle cell anemia. Pregnant women with sickle cell anemia were excluded from the analysis due to negative hematological parameters. IDA was identified in 89 women (89/829; 10.7%) and anemia of other etiology in 62 (62/829; 7.5%). The median CRP in IDA was 2 mg/L (0–69) and that in women with other anemia 11 mg/L (0–206). There were 654 pregnant women without anemia and with the negative inclusion criteria (654/829; 78.9%). The sensivity, specificity, PPV, NPV, and Youden’s index of different cut-off levels in nonanemic as well in anemic women for MCV are shown in Table 2, for MCH in Table 3 and for MRC in Table 4. On the basis of these results, the optimal cut-off level for identification of nonsickling hemoglobinopathies in nonanemic pregnant women as well in women with anemia for other reasons was MCV ≤80 fL, MCH ≤27.5 pg, or MRC ≥3%. A receiver operating characteristic curve for nonanemic women is shown in Figure 1. The combination of two parameters does not improve the sensitivity and specificity. Note: Results expressed in %. Abbreviations: IDA, iron deficiency anemia; MCV, mean corpuscular volume; NPV, negative predictive value; PPV, positive predictive value. Abbreviations: IDA, iron deficiency anemia; MCH, mean corpuscular hemoglobin; NPV, negative predictive value; PPV, positive predictive value. Abbreviations: IDA, iron deficiency anemia; MRC, microcytosis; NPV, negative predictive value; PPV, positive predictive value. Figure 1 Receiver operating characteristic curves of the three parameters for nonsickling hemoglobinopathy screening among nonanemic women. Abbreviations: MCH, mean corpuscular hemoglobin; MCV, mean corpuscular volume; MRC, microcytosis. By using MCH ≤25 pg, we correctly identified 79.2% of women with nonsickling hemoglobinopathies, and by using MCV ≤75 fL only 66.7%. An analysis using receiver operating characteristic curves and the calculated Youden’s index showed that MCV ≤76 fL, MCH ≤24 pg, or MRC ≥10% are the optimal cut-off levels for differentiation nonsickling hemoglobinopathies among women with concomitant IDA. MCH ≤24 pg had a sensitivity of 75% and a specificity of 91% (Youden’s index 83.0%; Table 3), MCV ≤76 fL had a sensitivity of 75.0% and a specificity of 78.6% (Youden’s index 76.8%; Table 2), and MRC ≥10% had a sensitivity of 70.8% and a specificity of 84.3% (Youden’s index 77.6%; Table 4). On the basis of our results, the algorithm of targeted antenatal nonsickling hemoglobinopathy screening is shown in Figure 2. Figure 2 The algorithm of targeted antenatal nonsickling hemoglobinopathy screening. Abbreviations: HPLC, high-performance liquid chromatography; MCH, mean corpuscular hemoglobin; MCV, mean corpuscular volume. The present study evaluates the sensitivity and the specificity of RBC parameters with different cut-off levels for targeted antenatal nonsickling hemoglobinopathy screening. On the basis of our results, the optimal cut-off level in nonanemic women and in women with anemia for other reasons are MCV ≤80 fL, MCH ≤27.5 pg, or MRC ≥3%; and in women with IDA, the values are MCV ≤76 fL, MCH ≤24 pg, or MRC ≥10%. The combination of two parameters does not improve the sensitivity and specificity. The sensitivity and specificity vary depending on the type of nonsickling hemoglobinopathy. Hence, MCV ≤75 fL was indicative in 100% of women with β-thalassemia, whereas it was indicative only in 53.3% of women with α-thalassemia. On the other hand, using lower cut-off levels, ie, MCV ≤77 fL or MCH ≤26 pg, the explicit decrease of the sensitivity was assessed among nonanemic women. To our surprise, half of the pregnant women with nonsickling hemoglobinopathies were nonanemic. Mild anemia with Hb >100 g/L was observed in only 16.7% (1/6) of women with heterozygous α-thalassemia, in 66.6% (6/9) of women with homozygous α-thalassemia, and in 50% (3/6) of women with heterozygous β-thalassemia. That means that if we only screen anemic women in pregnancy, we miss a huge group of women who are at risk. Therefore, laboratory diagnosis should be performed in all women with positive RBC indices regardless of hemoglobin and iron status. Using these parameters we can identify a huge group of individuals who are carriers of α- or β-thalassemia. However, as some women have normal red cell indices, it is impossible to detect all women by screening on the basis of the full blood count alone. Because of false positivity of red cell indices due to iron deficiency,13–15 different cut-off levels are used in nonanemic and anemic women. In women with IDA and MCV ≤76 fL, MCH ≤24 pg, or MRC ≥10%, the laboratory analysis is recommended because iron deficiency potentially masks hemoglobinopathy. It might be useful to correct iron deficiency before performing HPLC or molecular diagnostics. The limitation of our study is the lack of HPLC and molecular analysis in all women. However, in a country with a low prevalence of hemoglobin disorders, conducting universal screening would not be cost effective. The choice of the screening method is based on cost-effectiveness, and it has been demonstrated that at a prevalence of at least 16 sickle cell traits/1,000 there is no significant cost difference between universal and targeted screening programs. Therefore, targeted antenatal screening is recommended in Switzerland. However, as a result of our study, we presume the difference of the prevalence between prevalence in the country and in the big city. Zurich with the prevalence of 3.3% belongs to the high-prevalence areas. Therefore, like in Belgium, the universal antenatal screening should be limited to the big cities in the future. The second debatable point is the cut-off level of serum ferritin. In the literature, the cut-off level of serum ferritin varies between 10 μg/L and 20 μg/L.11,12 Because we saw high intraindividual variations between 10 μg/L and 20 μg/L, we chose ferritin ≤20 μg/L as the cut-off level. We thank Professor Rousson of the Department of Biostatistics, University of Zurich, for making statistical analysis with the receiver operating characteristic curves. Cao A, Rosatelli MC. Screening and prenatal diagnosis of the haemoglobinopathies. Baillieres Clin Haematol. 1993;6:263–286. Krafft A, Breymann C. Haemoglobinopathy in pregnancy: diagnosis and treatment. Curr Med Chem. 2004;11:2903–2909. Old JM. Screening and genetic diagnosis of haemoglobinopathies. Scand J Clin Lab Invest. 2007;67:71–86. Greengross P, Hickman M, Gill M, Dugan B, Davies SC. Outcomes of universal antenatal screening for haemoglobinopathies. J Med Screen. 1999;6:3–10. Bain BJ. Neonatal/newborn haemoglobinopathy screening in Europe and Africa. J Clin Pathol. 2009;62:53–56. Rogers M, Phelan L, Bain B. Screening criteria for β thalassaemia trait in pregnant women. J Clin Pathol. 1995;48:1054–1056. Law HY, Chee MK, Tan GP, Ng IS. The simultaneous presence of α- and β-thalassaemia alleles: a pitfall of thalassaemia screening. Community Genet. 2003;6:14–21. Working Party of the General Haematology Task Force of the British Committee for Standards in Haematology. The laboratory diagnosis of haemoglobinopathies. Br J Haematol. 1998;101:783–792. Wanapirak C, Tongsong T, Sirivatanapa P, Sanguansermsri T, Sekararithi R, Tuggapichitti A. Prenatal strategies for reducing severe thalassemia in pregnancy. Int J Gynaecol Obstet. 1998;60:239–244. Centers for Disease Control (CDC). CDC criteria for anemia in children and childbearing-aged women. MMWR Morb Mortal Wkly Rep. 1989;38: 400–404. Thinkhamrop J, Apiwantanakul S, Lumbiganon P, Buppasiri P. Iron status in anemic women. J Obstet Gynaecol Res. 2003;29:160–163. Institute of Medicine. Iron Deficiency Anemia: Recommended Guidelines for the Prevention, Detection, and Management among U.S. Children and Women of Childbearing Age. Washington, DC: National Academy Press; 1993. Swiss Federal Statistical Office. Demographic portrait of Switzerland 2005 Edition. Available from: http://www.bfs.admin.ch/bfs/portal/de/index/themen/01/22/publ/portrait_dem/liste.html?publicationID=1998. Accessed September 19, 2005. Demir A, Yarali N, Fisgin T, Duru F, Kara A. Most reliable indices in differentiation between thalassemia trait and iron deficiency anemia. Pediatr Int. 2002;44:612–626. Eldibany MM, Totonchi KF, Joseph NJ, Rhone D. Usefulness of certain red blood cell indices in diagnosing and differentiating thalassemia trait from iron-deficiency anemia. Am J Clin Pathol. 1999;111:676–682. Bencaiova G, Burkhardt T, Krafft A, Zimmermann R. Screening for β-thalassaemia trait in anaemic pregnant women. Gynecol Obstet Invest. 2006;62:20–27. Modell B, Ward RH, Fairweather DV. Effect of introducing antenatal diagnosis on reproductive behaviour of families at risk of thalassaemia major. BMJ. 1980;280:1347–1350. Rowley PT. Prenatal diagnosis for sickle cell disease. A survey of the United States and Canada. Ann N Y Acad Sci. 1989;565:48–52. Gulbis B, Cotton F, Ferster A, et al. Neonatal haemoglobinopathy screening in Belgium. J Clin Pathol. 2009;62:49–52. Lun F, Tsui N, Chan A, et al. Noninvasive prenatal diagnosis of monogenic diseases by digital size selection and relation dosage on DNA in maternal plasma. Proc Natl Acad Sci U S A. 2008;105:19920–19925.